Random access memory, or RAM as it is popularly known is one of the most integral components of a computer system or electronic device. RAM is mostly used in computers, but even devices like printers, mobile phones and the like use it. It is a volatile type of memory and involves continuous exchange of data. Data that needs to be processed and utilized quickly is stored in the RAM modules. With respect to computers, the first RAM modules were introduced in the 1950’s and have evolved to possess much greater capacities over the years. There are various types of RAM modules like SDRAM, DDR SDRAM, DDR2 RAM and the newest, DDR3 SDRAM. All of these modules differ with respect to the frequency with which data can be written and accessed. Needless to say, their capacities have increased as well. SDRAM stands for single data rate random-access memory and DDR SDRAM stands for double data rate synchronous dynamic random-access memory. As the name suggests, DDR was an evolution of SDRAM and allowed higher data transfer rates and at a certain clock frequency had double the data bandwidth of SDRAM. Furthermore, newer evolutions of RAM modules operated at lower voltages and were thus more power efficient. Like most such components, RAM modules are not backward or forward compatible. SDRAM was available in clock frequencies ranging from 66-133Mhz, DDR SDRAM was available in frequencies ranging from 100-200Mhz and operated at 2.5v, DDR2 SDRAM is available in frequencies ranging from 200-533MHz, operates at 1.8v and DDR3 SDRAM is available in frequencies ranging from 400-1066MHz and operates at 1.6v. Along with these classifications, RAM modules are available in low and high density types. Not all motherboards support high density RAM modules, most support low density RAM modules. Contrary to what the name suggests, “high density” RAM modules do not provide any performance gains, and in fact might perform worse on most motherboards that support only low density RAM modules. For example, a 1GB low and high density RAM module consists of 8 chips of 512Mb on each side for a total of 16 chips. These are arranged in the form of (512Mb x 16)/8 bits which gives 1024Mb or 1GB. In low density modules, each chip is organized with 64M bits with a data width of 8 bits, this is commonly expressed as 64M x 8 configuration. In high density modules, the same arrangement is seen, but each chip is organized with 128M bits with a data width of 4 bits.It is expressed as 128M x 4 configuration and is called high density. RAM modules are in the form of DIMM’s or dual inline memory modules. It is a series of integrated memory circuits on a printed circuit board. These circuit boards with the memory IC’s are collectively called RAM sticks. 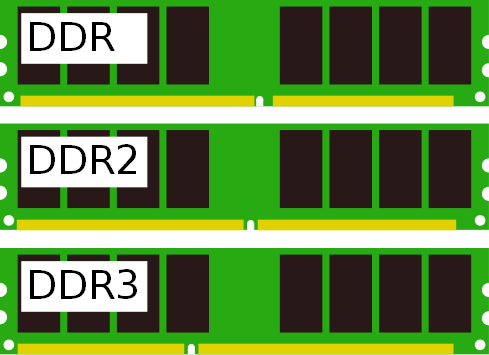 Every iteration of RAM modules ranging from SDRAM to DDR3 SDRAM are connected to motherboard DIMM slots and are recognized by different number of pins on one end. For example, DDR and DDR2 SDRAM are available in 200-pin DIMM configurations and DDR3 SDRAM is available in 240-pin DIMM configuration. For smaller devices like laptop computers, mini ATX computers, high end printers and networking devices, RAM modules are available in SO-DIMM type. SO-DIMM stands for small outline dual in-line memory module. Similar to usual DIMM’s, SO-DIMM’s also come with different pin configurations. 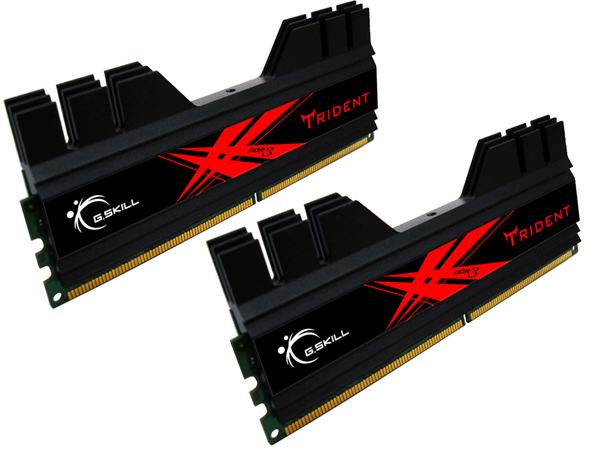 As of now, the main two types of RAM available in the market are DDR2 SDRAM and DDR3 SDRAM. So if you’re out to build a new PC or even upgrade your current PC, what should you go for? It basically depends on what you really want. If you need to run the latest games at the very highest details and resolutions and don’t want to compromise, no doubt DDR3 SDRAM is the one you should go for. For most daily tasks DDR2 SDRAM is more than enough for now. Now, the issue here is that even if you have decided to upgrade to DDR3 SDRAM, you’re going to need to upgrade your motherboard as well. Only AMD motherboards with AM3 slots and Intel motherboards with LGA 1156 or LGA 1366 support DDR3 SDRAM. So if you’re looking to simply upgrade memory, we’re afraid you’ll have to spend on lot more than just the RAM sticks. Frankly speaking, at the moment there are very very less programs that actually require high memory bandwidth. Even highly system intensive PC games show a gain in performance in the region of hardly 2-3%. That sort of performance gain is not worth spending too much money on to upgrade, just to jump on the DDR3 bandwagon. However, newer PC’s come equipped with DDR3 SDRAM and if you’re looking to buy a new PC, you must go for DDR3 SDRAM. The good news is that the prices of DDR2 and DDR3 RAM sticks are very similar, it’s only the other components that might cost you. The bottom line is, if you’re buying a new computer, make sure the memory is DDR3 SDRAM. If you’re looking to just upgrade, hang on to good ol’ DDR2 SDRAM for now. But always remember, if you’re going to buy over 3GB of RAM, you must have a 64-bit operating system to actually make use of it! nice info.,good effort..keep it up..